New research from World First, the international currency experts, reveals Cambridge as the best place for international students to get their higher education. Taking into account university performance, cost of living, tuition fees and the desirability of the city, World First’s new university ranking for international students shows that UK universities are the cream of the crop with Cambridge, Edinburgh and Oxford all occupying the top three positions respectively. Cambridge’s reputation as the third best university in the world, along with its pull as a historical city coupled with a lower cost of living in the city, saw it come out on top, beating competition from across the world. The world famous Harvard University was the highest of the Ivy League US universities at ninth in the league table. Affordability and liveability had a significant impact on which universities fared better for international students with Australian National University and the Swiss Federal Institute of Technology completing top 5 due to affordable school fees and high liveability scores. 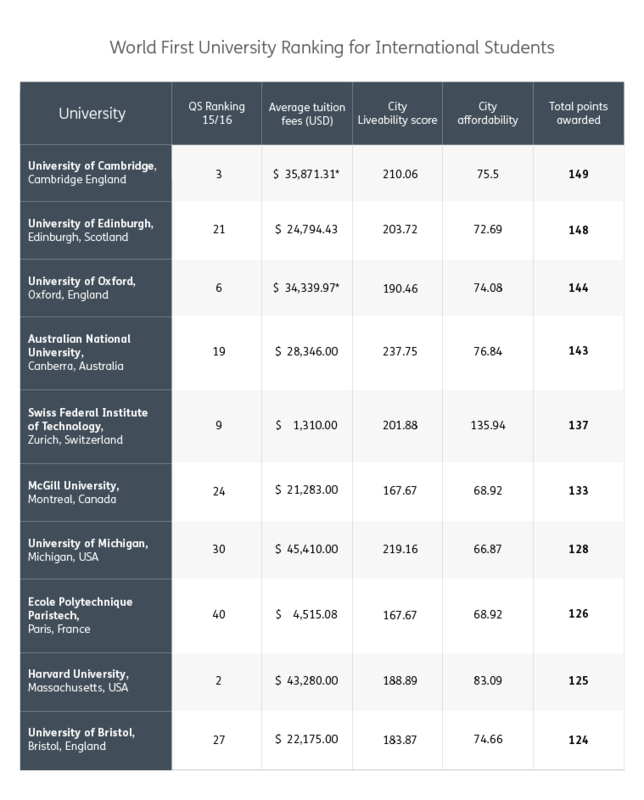 American universities with great reputations were hurt by extortionate tuition fees with only the University of Michigan (7th) and Harvard University making the top ten. 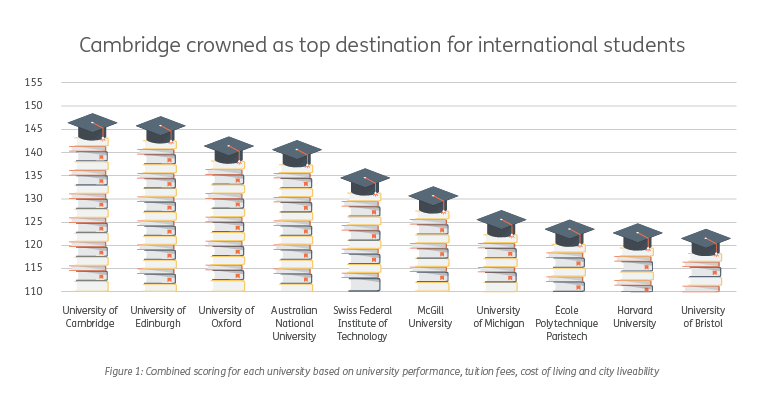 McGill University in Montreal (6th), Ecole Polytechnique Paristech (8th) and University of Bristol (10th) completed the top ten. “When choosing an overseas destination for university, the quality of the teaching is just one deciding factor. Our research shows that some of the top universities, while having a particularly strong reputation, do not necessarily deliver on some of the other important deciding factors. That could mean that they hit students with crippling course fees, are located in cities with a painfully high cost of living or just offer a poorer quality of life. The recent fall in the value of the pound also means that UK universities have become increasingly more affordable for university students compared to American universities as the dollar maintains its strong run. UK universities will be cheaper for pretty much all international students since Brexit, not just US. One good thing from Brexit: makes UK more attractive as a study destination. Edward Hardy added: “The politics and economics of Brexit are not yet known and will likely take months or years to fully affect the price of the pound. In the meantime, students or their parents will be looking at a likely volatile and less-valuable sterling. Methodology: Research conducted by World First in August 2016. Scores awarded to reputation (based on QS World University Rankings 2015/2016), tuition fees, city liveability and affordability (based on Numbeo quality of life and cost of living index as of August 8 2016). All fees obtained from institution websites and brochures.